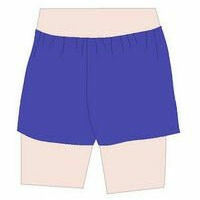 Shorts for work-out wear or tumbling competitions. Our sizes run different than other leotard companies you may be familiar with. Please refer to our size chart for proper sizing of your gymnastics shorts. If you are purchasing for a team, please call 888-496-3441 and ask about our sizer packs. Gym Digs is your one-stop-shop for boy's and men's gymnastics wear. The additional pictures show shorts in Navy and Royal and Silver/Gray.